Accueil Streaming McFarland, USA – Streaming. 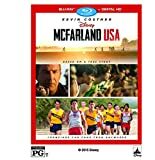 Regardez les vidéos du film McFarland, USA de Walt Disney Pictures en streaming : bandes-annonces, teaser, extraits, featurettes, making-of, bonus…en VF, VO et VOST. McFarland, USA - "Cross Country"
McFarland, USA - "Tell Him I Said Thanks"
McFarland, USA - "Believe In Yourselves"
McFarland, USA - "The Anchor"
McFarland, USA - "I Want That Back"